icturesque Wells Market Place was packed with 160 motorcycles of all ages awaiting the start of the 8th annual Tortoise and Hare Run organised by the Wells Classic Motorcycle Club to raise funds for the Dorset & Somerset Air Ambulance on the morning of Sunday, June 3. Entries came from as far afield as Yorkshire, Surrey, Wales, Devon, the south coast and the Isle of Wight, and the sun shone all day long. 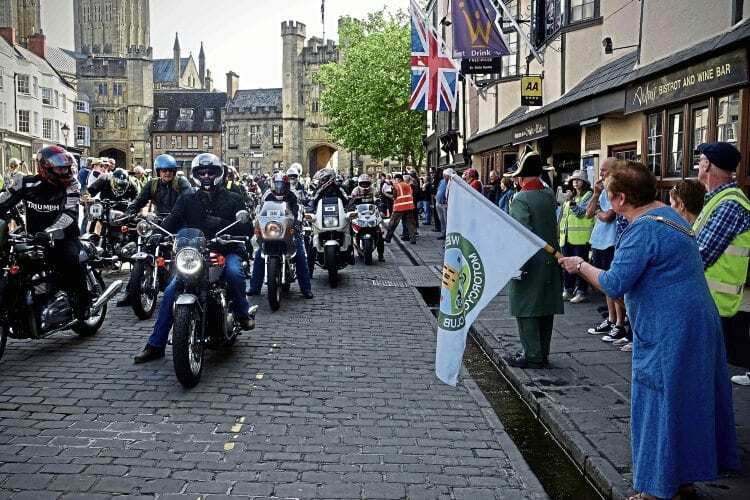 Riders are flagged away from Wells Market Place at the start of the Tortoise and Hare Run on Sunday, June 3. Assisted by the town crier, the Mayor of Wells flagged away the various run groups on their journey over the East Mendip Hills to Castle Cary Rugby Football Club, where entrants in all three run sections took a coffee break. This was followed in the afternoon by more scenic routes for both the ‘Tortoises’ and ‘Hares’ over the North Mendips, again following different routes, and this year the ‘Snail’ group was also well attended as participants took in fairly level roads around the Somerset Levels. Read more (including award winners’ list) and view more images in the July 2018 issue of OBM – on sale now!